Ethiopian pop star Teddy Afro's album launch stopped by police – Satenaw Ethioopian News & Breaking News: Your right to know! 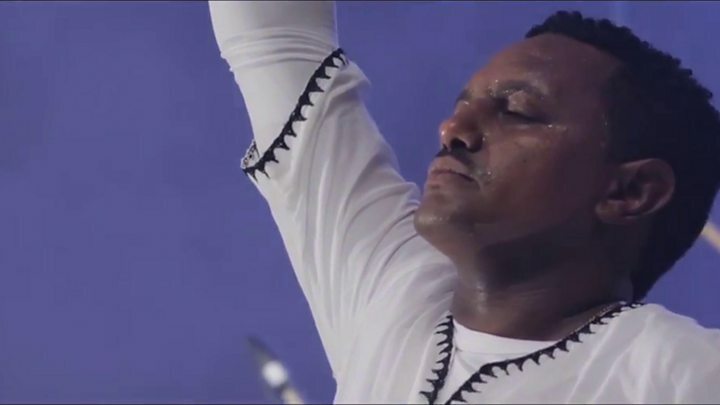 Authorities in Ethiopia have stopped singer Tewodros Kassahun, popularly known as Teddy Afro, from launching his much-acclaimed album, Ethiopia. A BBC reporter says federal police showed up at the hotel in Addis Ababa hours before the party and stopped Teddy’s sound team from setting up. His manager told the BBC that they are yet to get official reasons why the launch party was cancelled. Teddy’s 15-track album is the fastest-selling album in the country’s history. Following its release in May this year the album topped the Billboard World Albums chart for weeks. However, it was never formally launched in Ethiopia. On his Facebook Page, Teddy Afro has termed the police demand for a permit as ridiculous. His concert scheduled for the eve of Ethiopian New Year, which falls on 11 September, has also been cancelled in unclear circumstances. Teddy Afro is a huge figure in Ethiopia. He enjoys an almost cult-like following and his latest album – his fifth – has elevated him to legendary status. The album is like a history lesson, with references to Emperor Tewodros II, seen as the father of modern-day Ethiopia, and it also calls for unity among Ethiopians. Teddy is no stranger to controversy though. In 2008, he was jailed for a hit-and-run accident. He has always maintained that the case against him was politically motivated. He raised the ire of the authorities in 2005 when he released an album that was seen as critical of the authorities in the wake of disputed elections, but Teddy has tried to distance himself from politics. He still enjoys a massive following among Ethiopians who adore and revere him. Months after his album was released, his music is still being blasted out on public transport, in bars, local shops and homes. Ethnic Politics and the Addis Ababa Master Plan !! !